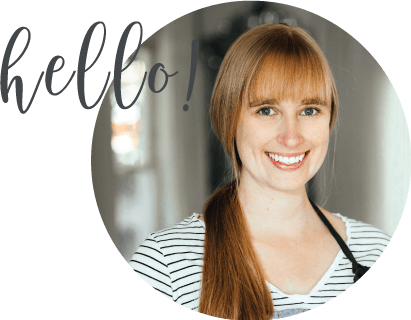 I’m not about to let a holiday season slip by without sharing a recipe for the bacon-lover in your life. Admit it, you all know someone who is obsessed with bacon – why else would we mass produce bacon bandages, bacon toothpaste, bacon socks, and for all those bacon-pizza-cat-lovers: THIS? 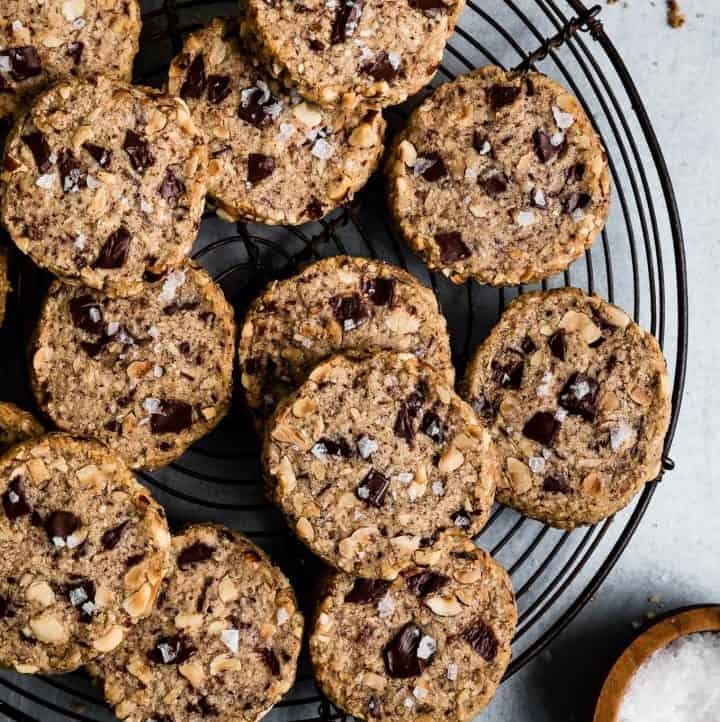 I’m actually not sure who the target consumer is for all that bacon paraphernalia (except maybe that last one – *coughtylercough*), but for these bacon fat cookies? 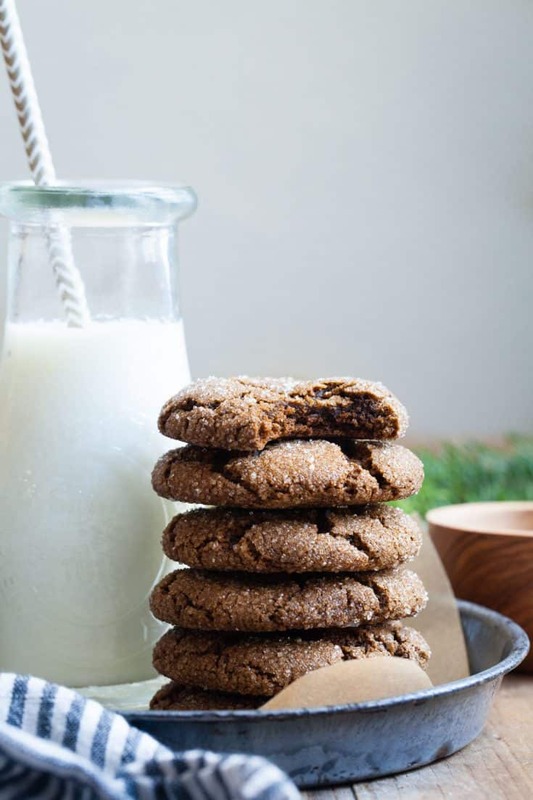 Trust me – you don’t have to be bacon-crazy to want these chewy salted bacon fat ginger molasses cookies in your belly asap. I first made these bacon fat cookies last Christmas as a gift for Tyler (my bacon-lover) along with some homemade maple bacon fat caramels, but didn’t get it together in time to share them with you for the holidays. And I’ve been dreaming about them ever since…and collecting a jar of bacon fat in anticipation of more bacon fat baking this year. Some people collect rocks or stamps, but me? I collect bacon fat. You? 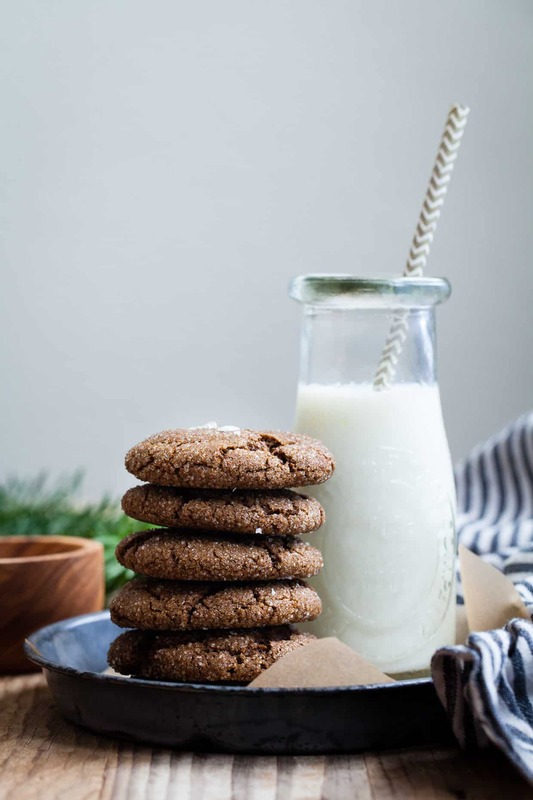 For the base recipe, I slightly adapted Alanna’s ginger molasses cookies and then subbed in half of the butter for pure bacon fat goodness (how many times can I say bacon fat in a single post?). 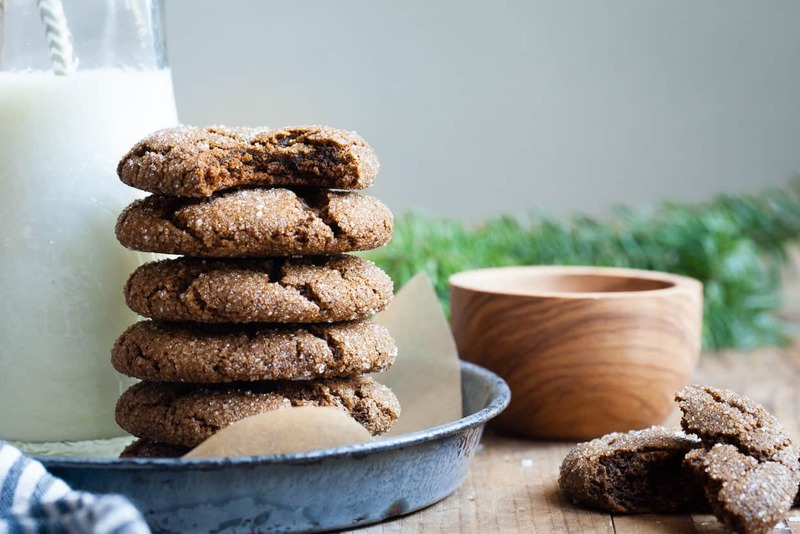 I’m pretty sure this means you can (and probably should) sub bacon fat for butter in any cookie recipe ever, but bacon fat was meant for these ginger molasses cookies. 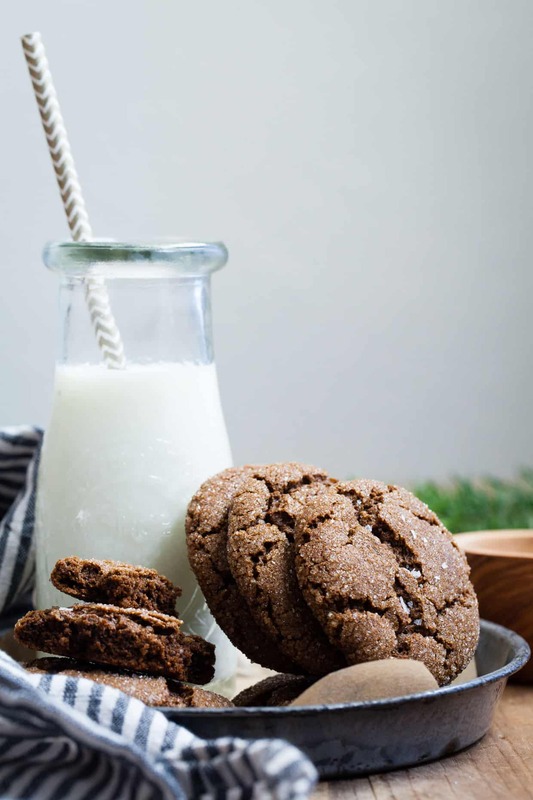 Alanna’s ginger molasses cookies are in my top five favorite cookies of all time. 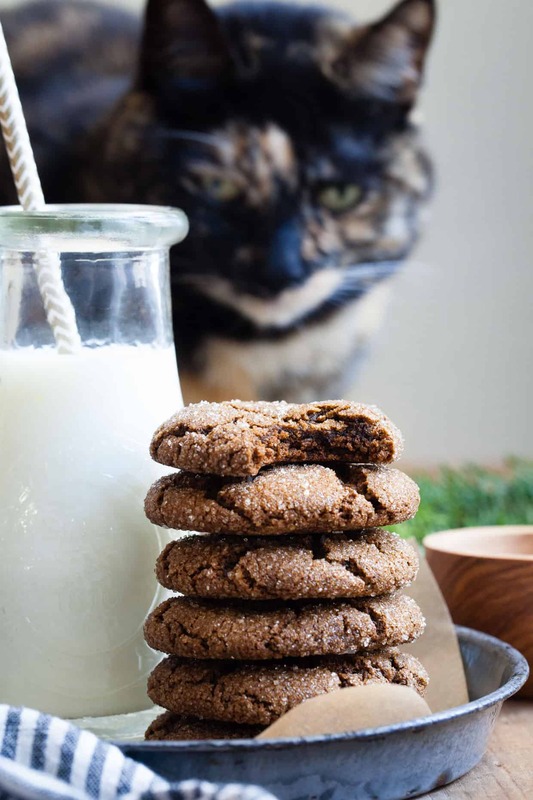 She’s been perfecting a (very different, but equally delicious) chewy ginger molasses cookie for her cookbook (!!) this past year and I’ve been lucky enough to get to try at least one cookie from every batch. Sometimes she even just brings me a container of dough to keep on hand because she knows how much I crave these cookies. Givin’ me all the feels, ya’ll. Since today is her birthday (In unison, folks: HAPPY BIRTHDAY ALANNA! ), there’s no better day than today to share my salted bacon fat adaptation. Timing it so I can bring her a few freshly baked cookies for dessert tonight. 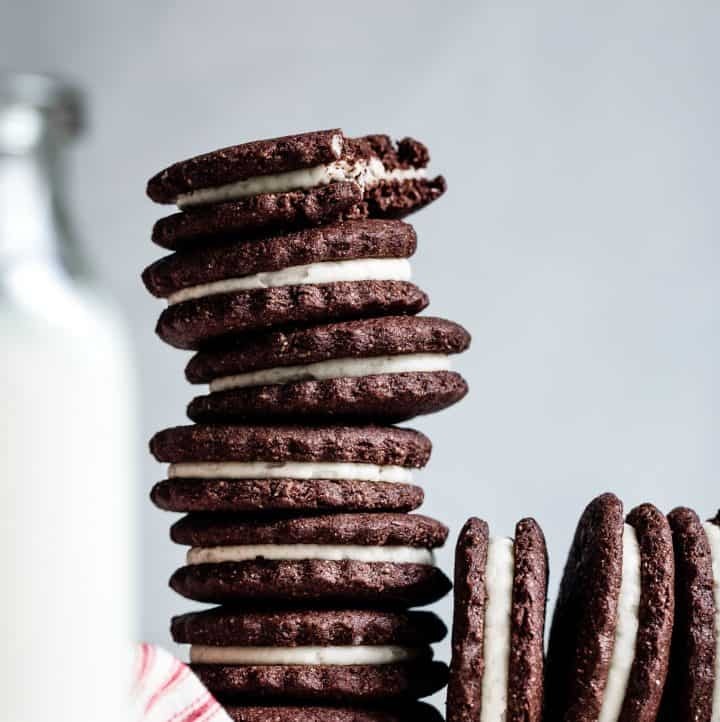 Like I said – these cookies are pretty special all on their own. 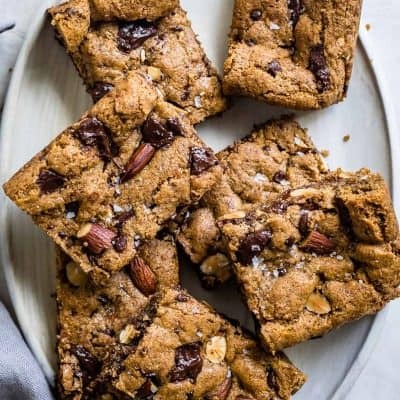 They’re super moist and chewy with dark molasses richness in every bite. In my version, I changed up the spices by adding cardamom (because I’m obsessed), threw some flaky salt on top to boost the savory sweet hybrid, and added a bit of chestnut flour to give the cookie some toasty nuttiness. And then there’s the bacon fat – the star – adding a subtle smoky flavor that deepens the richness of the molasses. 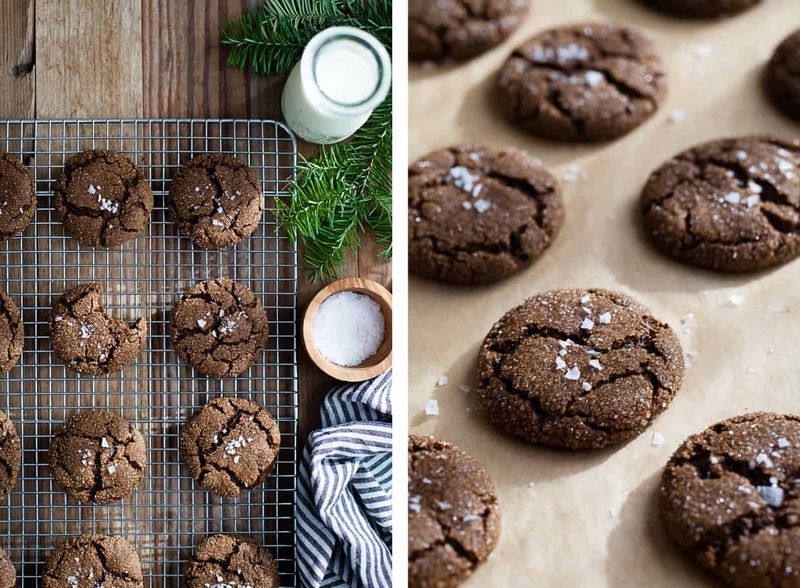 These cookies most definitely need a spot on your holiday cookie tray. These babies are day 16 in Rodelle’s 21 days of cookies! 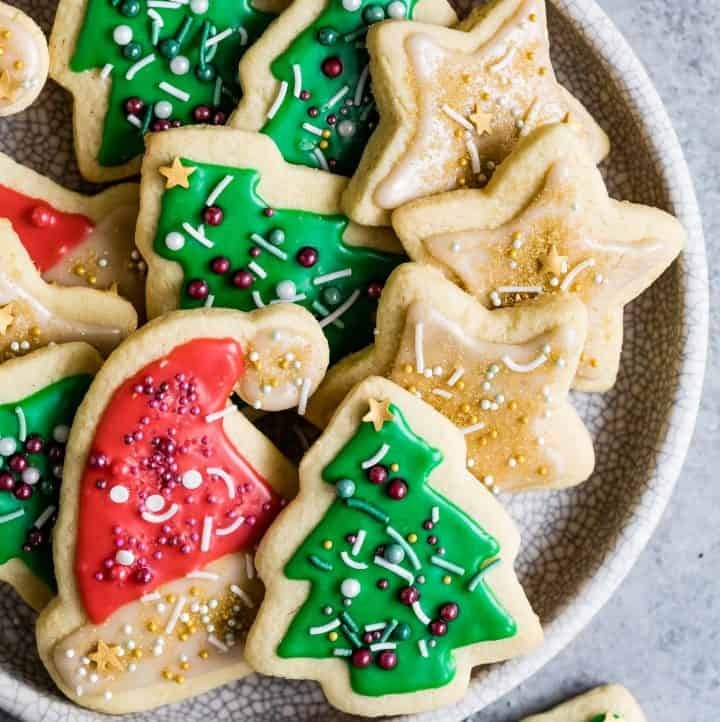 Head over there for so many more holiday cookies. 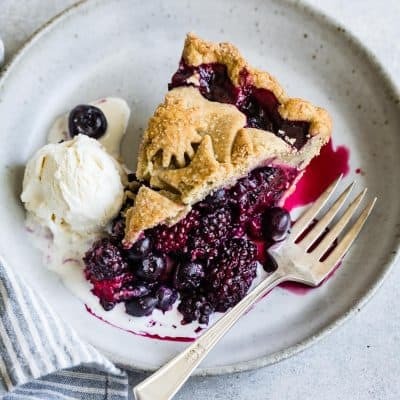 Sift together the sweet rice flour, oat flour, chestnut flour, tapioca starch, xanthan gum, baking soda, ginger, cinnamon, allspice, cardamom, and salt in a medium bowl. 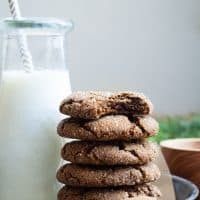 In the bowl of a stand mixer fitted with the paddle attachment, or by hand, stir together the molasses, brown sugar, 1/3 cup of granulated sugar, butter, and bacon fat until completely combined. 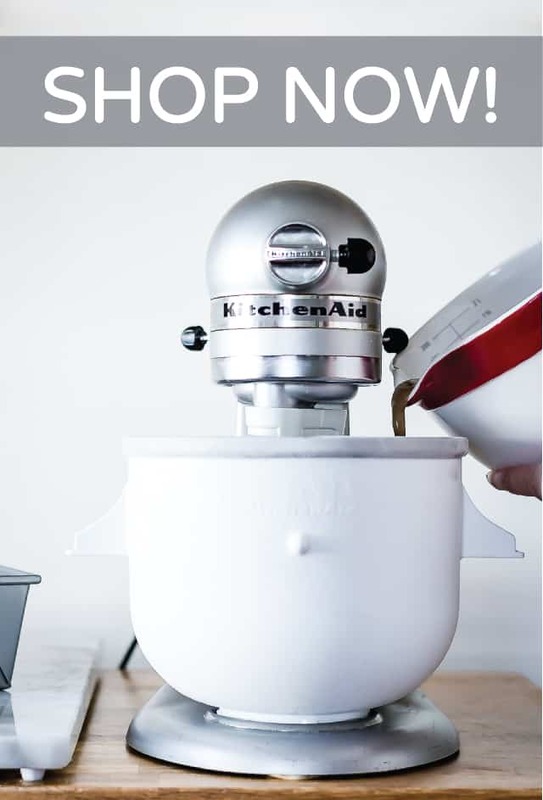 With the mixer on low speed, slowly add the dry ingredients, one cup at a time, mixing until completely combined. The dough will be rather soft. Form the dough into a flattened ball, wrap it in plastic, and refrigerate for at least 2 hours, but preferably overnight. 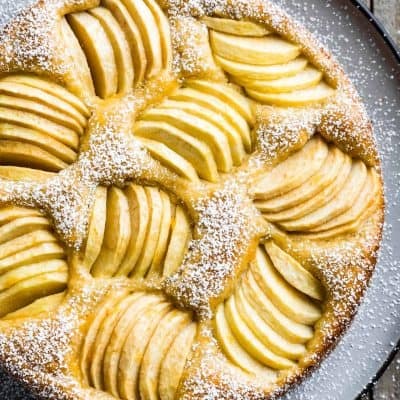 When you're ready to bake, position a rack in the top third of the oven and preheat to 350°F. Line two large baking sheets with parchment paper. Prepare a small bowl of the remaining 1/3 cup of sugar. Scoop and roll 1½-inch balls of dough, roll each ball in sugar, and place 2-inches apart on the baking sheet. 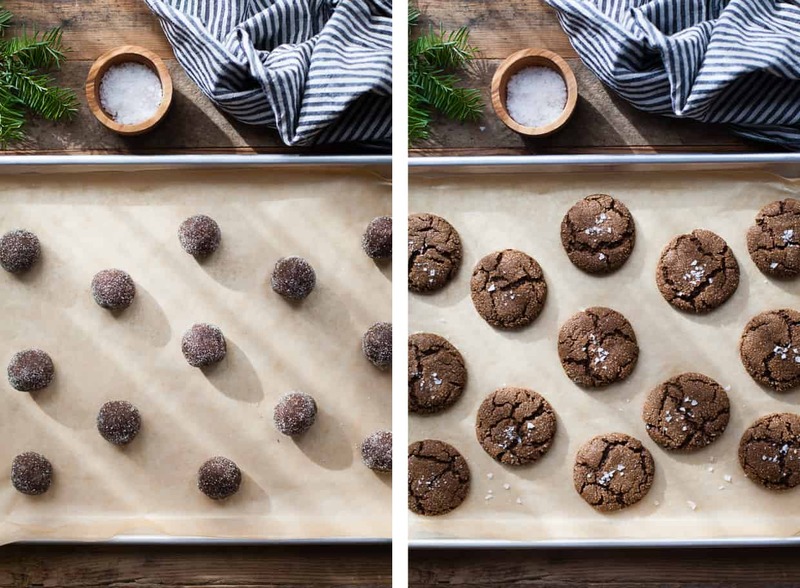 Refrigerate the first baking sheet for at least 10 minutes, while you roll the rest of the cookies. Bake the chilled baking sheet for 8-10 minutes until the cookies puff and the tops just begin to crack while the dough underneath looks under baked (err on the side of under baked or else your cookies will be more cakey than chewy). After 5 minutes, crack the oven open and sprinkle the cookies with flaky salt. While the first sheet is baking, chill the second baking sheet and repeat the baking with the second sheet. Cool the cookies for a couple of minutes on the baking sheet then transfer to a wire rack to cool completely. 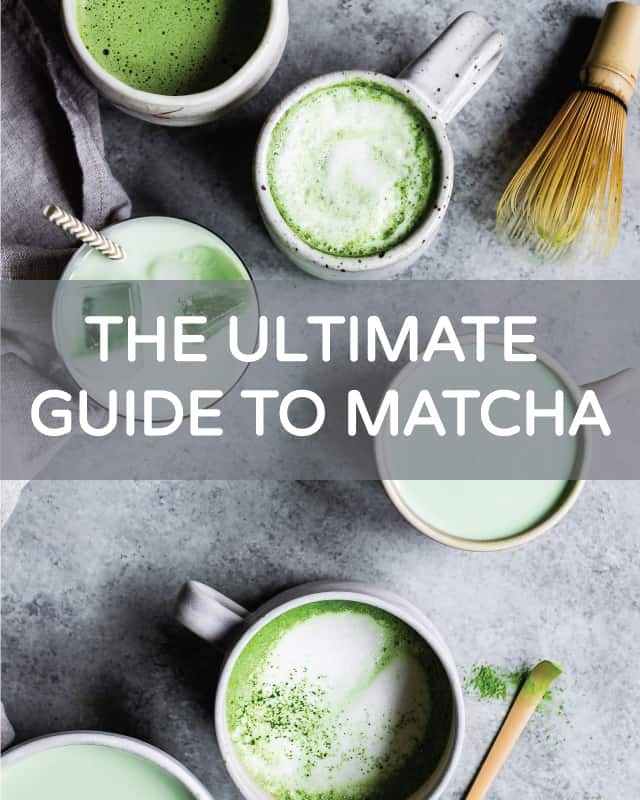 *For non-gluten-free version replace the sweet rice flour, oat flour, chestnut flour, tapioca starch, and xanthan gum with 2 cups all-purpose flour, sifted. 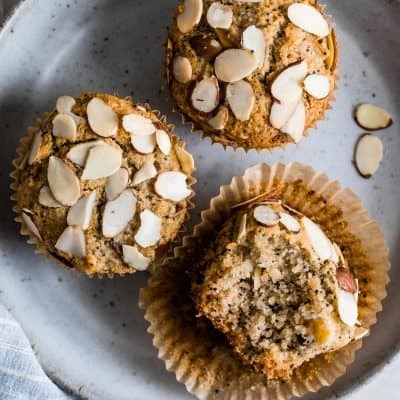 **I grind my own oat flour by pulsing gluten-free oats in the blender or food processor until fine, then sifting out any large pieces. These cookies induce glossy-eyed bacon fat determination. 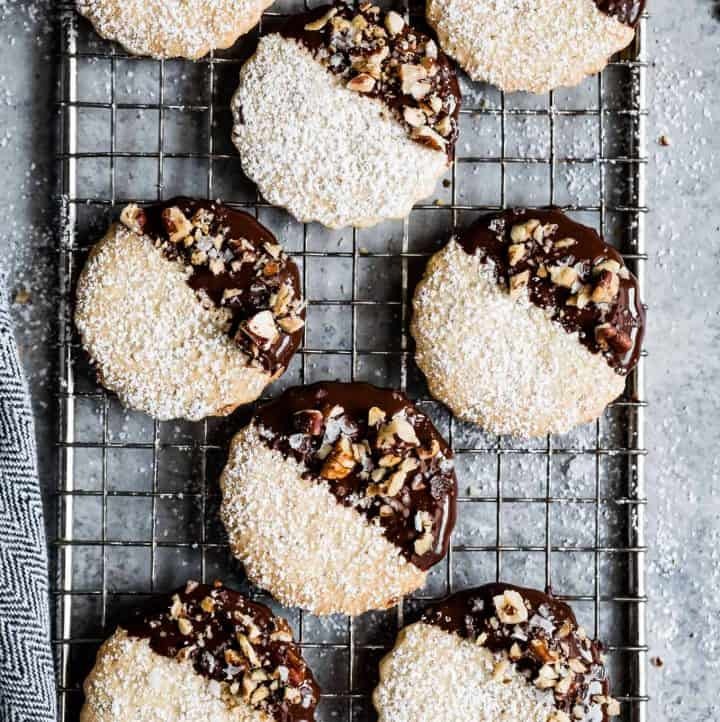 Um, I do not even think there are words to describe how incredible these cookies are. 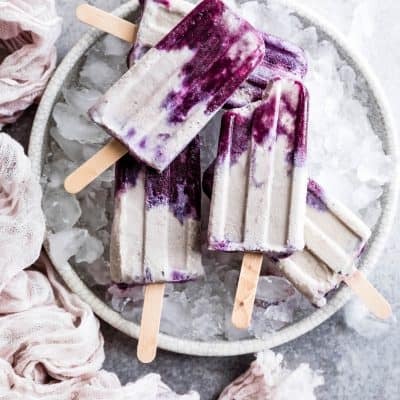 Just whoa and YUM! Yes! Bacon in my cookies! This looks so good! I see Miss Aioli can not resist them either! Those crinkly tops! Goodness these are pretty! 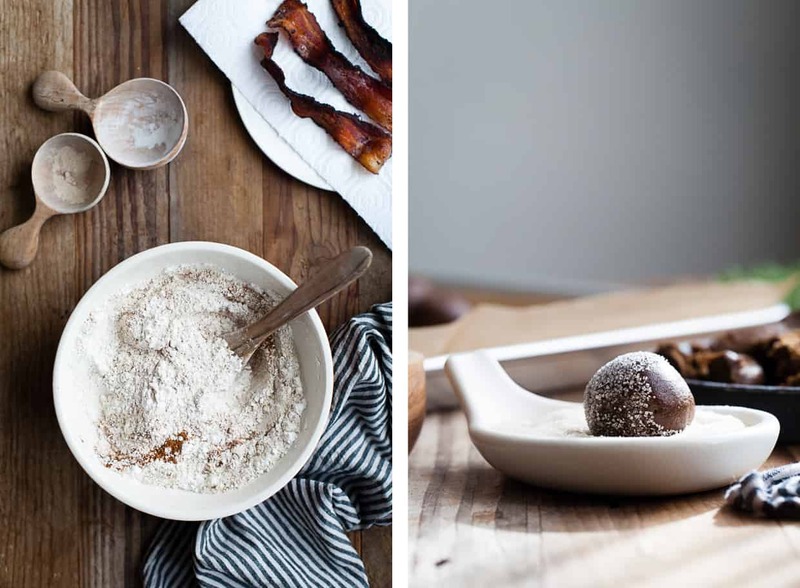 How can I not come over and look at this recipe when I see BACON FAT and COOKIES in the same sentence?!?! Oh my word these look incredible!!! Stunning and GENIUS!!!! Bacon fat, seriously?! Woh. In the best ways. These look so awesome! You and Kevin (keviniscooking.com) are on the same wavelength…now I have two to try!! 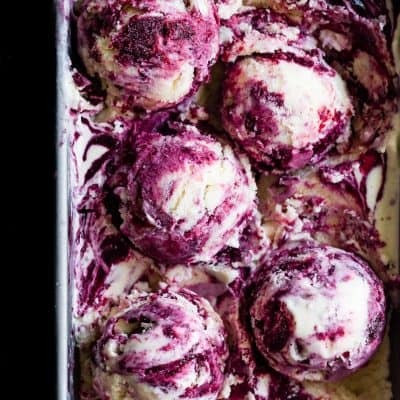 You totally have blown me away with this recipe–incredible! You KNOW how much I appreciate a good crackling on top when I see it on a cookie! These sound so good, Sarah….and that’s coming from someone who can give poop about bacon. Sorry, still love ya, hope you know! Lol. Now, Korean style pork belly meat? That’s a whole different story and I can easily eat too many and end up feeling guilty for days. yes! pronounced ‘best gingersnaps ever’ by my mother-in-law, who was the only one who spoke up because the rest of the table was just narfing up cookies very quickly, and of course are simply too genteel and well-mannered to speak with their mouths full. My stash of bacon fact came from frying up some pepper bacon, so fyi THAT WORKS TOO.